When I sat down to think about where inspiration comes from the first thought that came to my mind was, hunger. Well, it was past noon and my body was telling me that it was time to put some nourishment into it. So, even though the fingertips were gently pulsing, anticipating the feeling of euphoria as an idea takes shape, I took a quick break to answer the stomach’s gnawing demand. The fingers were introduced to the sweet and oft times aggravating feeling of anticipation. Once satiated, I was able to concentrate on the bigger picture. I believe a huge part of inspiration comes from the manifestations of human emotion due to internal and external stimulation and the senses that are triggered by those emotions. That’s a little cerebral so I’ll drill down just a bit. As I was sitting on my balcony one sunny morning, listening to the birds in the trees and sipping my coffee, a slight movement out of the corner of my eye caught my attention. Living in Thailand I’ve learned not to jump at the slightest touch or movement… actually developed a sense of awe at the creatures, big and small, milling about on their daily mission. So, I’ll get back to my example. There was a slight breeze and the tree right next to the railing was tickling my left elbow. As I gazed closer at a darker patch on the leaf closest to me, I saw the most peculiar bug happily riding the swaying leaf. I was mesmerized. He was brown so the colour wasn’t that riveting but the closer I looked and the more detail I took in, the cooler he became. He had several body sections separated by zigzag lines. 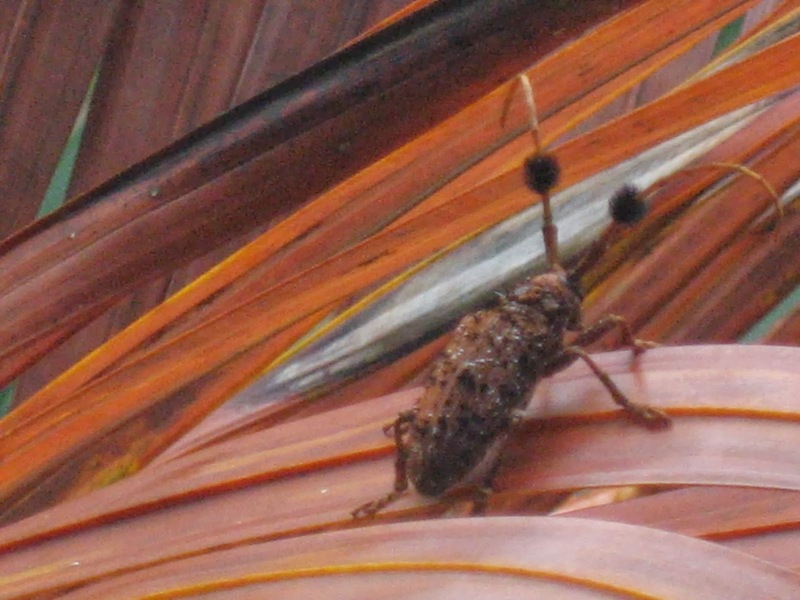 His head sported long, thin, antennae topped off by round, fuzzy balls with the finest little hairs. I couldn’t help thinking that this was probably the type of creature that inspired the creators of the characters in Pixar’s Monsters Inc. and maybe even Avatar; definitely Dr. Seuss! Imagination needs to be sparked by something and nature is a prime suspect in my world. The inspiration for my first novel, Mental Pause, which launched on March 8th, 2013 came from what is, in my opinion the worst symptom that a women suffering from peri-menopause can have… The Night Sweat. It’s evil incarnate. I had been having them every night for months and the lack of sleep was starting to wear on me, not to mention wearing out the sheets that had to be washed almost daily. One particularly slimy night, even though the A/C was pumping full blast, the sweat burst forth and I lay there taking stock of the sensations it was eliciting both physical and emotional… the crevices that pools were forming in and the texture of my skin. Since I couldn’t sleep, I did what most writers would do. I hit the keyboard and pounded out the mad ramblings of a peri-menopausal woman. I laughed and cried as I wrote and thought, ‘this woman is crazy.’ In order to make myself feel better, I added a bit of imagination to it (spurred on by the delirium from exhaustion, which can also provide some great inspiration) and turned it into a novel. That first rambling session that described the night sweat found a home in chapter 1 of my novel. So, we are inspired by the beauty of nature and sometimes driven to inspiration by physical discomfort. Anything else? I just had a tooth pulled so the next time I need to describe a nasty assault on the senses, I’ll have some inspiration to draw from (I have a phobia of dentists so my experience was filled with more angst than most, although I don’t think many people enjoy a ride in the dental chair). My hands are even starting to shake with the memory as I write this so allow me to leave it at that! like a thousand red ants leaving tiny, scorching footprints behind. I do tend to refer to nature a lot when I write but whenever I need a little help in drumming up some inspiration to describe emotions and feelings I reach for The Emotion Thesaurus by Angela Ackerman and Becca Puglisi. Sometimes it gives just the nudge I need to shake things up a bit. It sure beats going to the dentist! Note: this blog first appeared as a guest post in The Alliterative Allomorph: The Artist Unleashed as part of the Virtual Book Tour for the launch of my first novel, Mental Pause. The Alliterative Allomorph is the brain child of Jessica Bell, the author of Adverbs and Cliches In a Nutshell (there's actually an 'In a Nutshell' series of books Jessica has written). My condolences on the pulled tooth. The dentist and I are dear old chums thanks to my less-than-stellar teeth. I've been trying to work more comparisons into my writing a lot lately. Thanks Jeri! I was sad to see it go. I do tend to pull in lots of personal experiences into my writing and then close my eyes to imagine what would be different depending on the circumstances of my character. Start with what you know and then let it take on it's own life!